Not everyone wants to visit the gym to work up a sweat to stay healthy. Save money on the membership fees and buy a portable sauna. We have selected the top 10 portable saunas for you to buy in 2019. They are great to use at home, easy to set up, simple to use, have a convenient design, and heats up fast. Now you can sweat in the comfort of your home detoxifying your body to stay healthy. They help you lose weight faster, enhance your blood flow, reduce stress, improve your metabolism, and aids in muscle & joint pain. You can even take them with you on your vacation or if you are a frequent traveler. The great thing is you do not a huge space to set them up. They fit into small spaces with ease. However, if you prefer a more permanent one you can always look at the larger models found here as well. The Koval offers you the most affordable way to cleanse your body. You can decide which color suits your lifestyle and needs. Choose from blue, pink, red, or silver. The sauna has a portable design making it easy to move from one room to another. Setting up the units a breeze just makes sure you have a power outlet close by. The steam pot holds up to two-liter of water and you receive a remote control to regulate the temperature. A beneficial thing is you even receive a foot massager included for the amazing price. With the herbal box, you can add your favorite herbal mix for an aromatherapy session while steaming away. 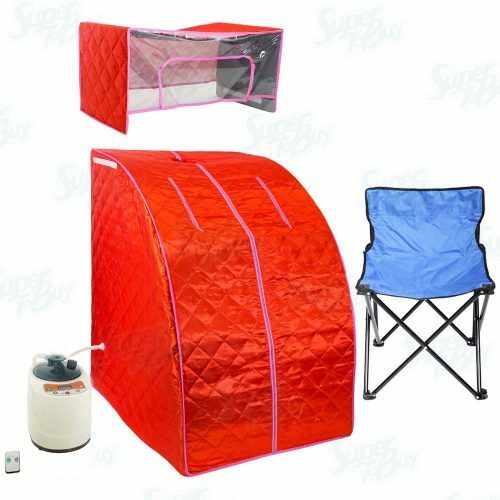 If you prefer relaxing at home in a portable sauna, look at the WYZworks Steam model. Here you have the choice of choosing your favorite color from different shades. 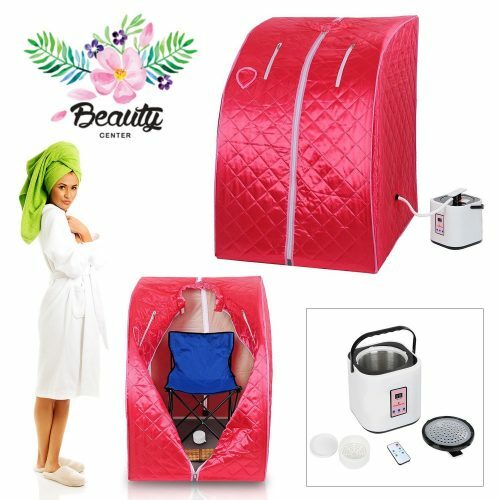 With the two-zipper design, you can access the sauna with ease and do other tasks while relaxing. If you want to enjoy a facial sauna, you receive a head cover included. Included are a foldable chair and the post holds two-liters of water. There is an herbal box and it has different power levels. The sauna measures 33 x 29 x 39-inches. 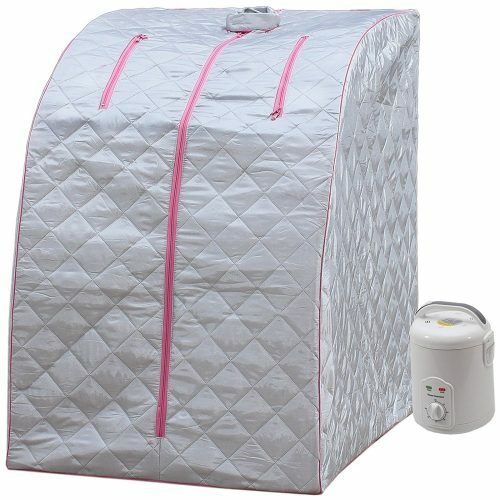 The DURHERM DSS-404 portable sauna has a powerful 800-watt steam generator with a 60-minute timer. As with the other models, you can also choose your preferred color outline from blue or pink. The steam generators separate from the sauna and the sauna measures 28 x 33 x 43-inches. Cleaning the saunas a breeze and only needs a wipe out with a towel. The sauna has bathtub design and makes sitting on a chair comfortable. 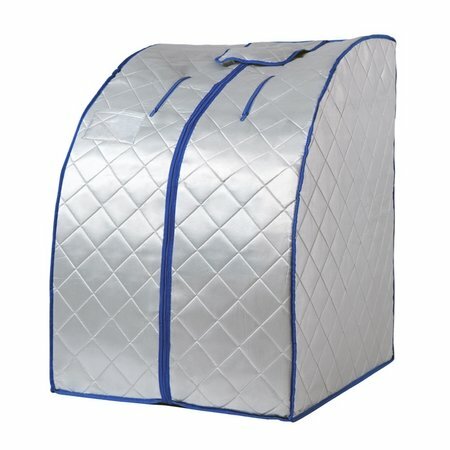 Nothing is more mobile than the Ridgeyard portable sauna made of satin polymer material. You can fold it up for storage or take with you while traveling. 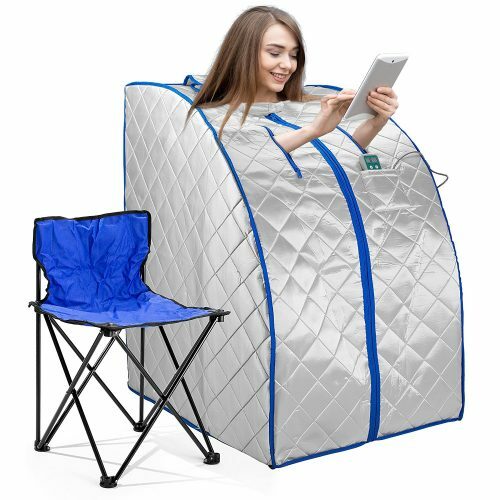 This mobile sauna has a built-in auto shut-off feature for safety. This is an EMC certified product and you can control the temperature with remote control. Included you receive a foldable chair with heated footpad. The unit measures 39.3 x 26.7 x 32.2-inches and weighs 23.59 pounds. Another great thing is Ridgeyard backs their product with a three-year warranty. If you need a sauna that heat, up quickly, the FAR INFRARED mobile model heats up in 5-minutes. The sauna has negative ION infrared heating elements and a timer you can set up to 30-minutes. Included you receive a folding chair and heated footpad. The dimensions of the unit are 27.5-inches wide with a 30-inch depth and stand 38-inches high. The great thing is while you are sweating away the negative ions purify the air. 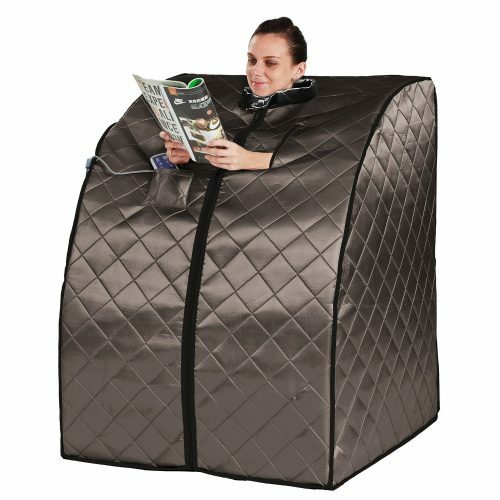 The Therapeutic Steam Sauna has a spacious design and is easy to use. The unit measures 29-inches wide with a 27.5-inch depth and stand 38-inches high. The 800-watt steam generators powerful and the pan holds up to 1.8-liters of water. The portable sauna automatically shuts off once it senses a low water level. You can set your preferred temperature from 10 levels of settings. There is a huge center zipper with two small zippers on each side. The RADIANT Rejuvenator has a polyester design making it lightweight to move. The panels ETL approved and made of EMF carbon fiber. The controller has six automatic timer options with five levels of pre-set heat temperatures. The dimensions of the sauna are 28-inches wide with a 33.5-inch depth and stands 38.1-inches high. The saunas fully insulated with zippered hand holes and work with FAR heat technology. 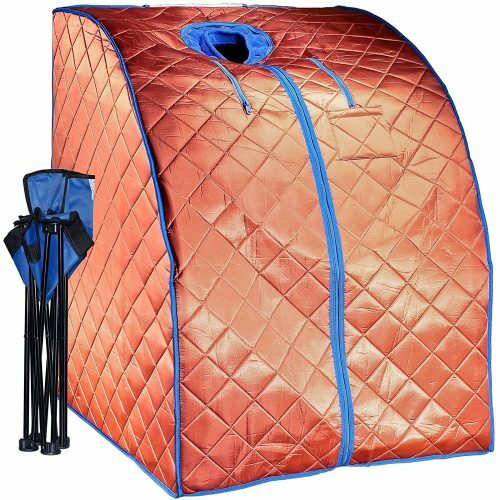 The Gizmo portable infrared sauna uses light to create relaxing heat for your body. The great thing about this sauna is that it heats your body directly leaving your body comfortable and relaxed. The unit has a zipper for ease of access and includes a handheld controller and footpad heater. The sauna measures 41-inches high and is 31-inches wide with a 33-inch depth. Furthermore, it has a timer you can set between 5-60-minutes. 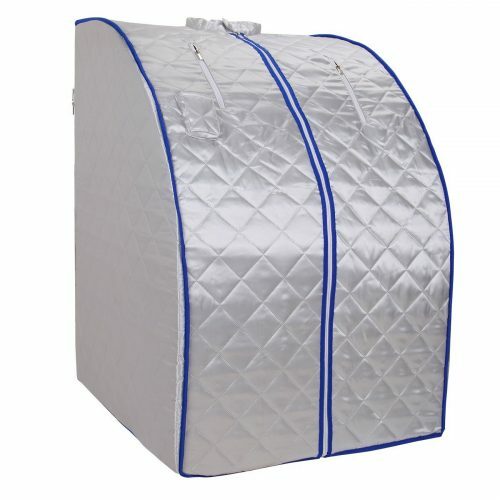 For detoxification and relaxation at home, get comfortable in the DURHERM EMF free portable sauna. 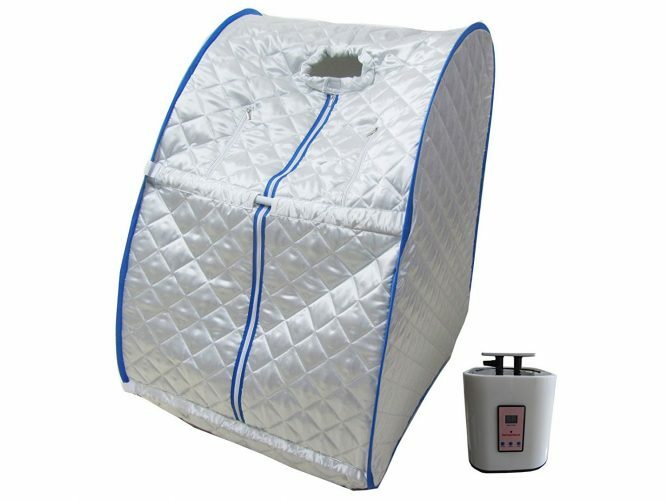 The sauna emits very little EMF and has a soft washable neck collar you can remove to wash. This is an X-large sauna that generates more heat with less power. The warm-up time is less and helps reduce costs on your electricity bill. The unit comprises of three heaters made of tourmaline panels. The unit measures 31.5 x 33 x 41-inches and weighs 25-pounds. DURHERM backs their product with a year warranty. 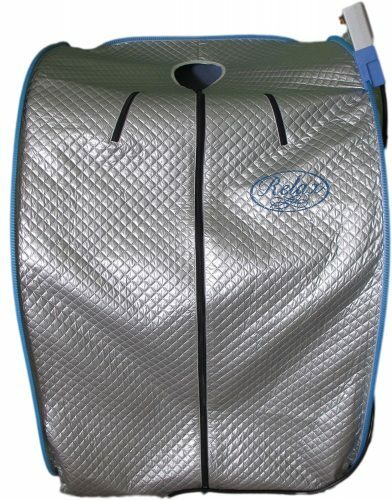 If you want to cleanse your body at home, the Relax Far Ray portable sauna might be more expensive, but is one of the best available on the market. The unit has a computer-programmed chip and helps filter out light rays that help your body to heal. The sauna measures 31.5 x 31.5 x 45.3-inches and weighs 26 pounds. Furthermore, it has a durable construction that is easy to set up and store away when not needed. You too can have a great sauna session in the comfort of your home. The top 10 best portable saunas in 2019 are convenient to use. The great thing is you can take it with you on vacation as long as there is a power outlet nearby. Once you are done and do not need to use it anymore, fold it away and store it under the bed or your cupboard.